‘I’m as cold as an alligator in a frozen swamp’ is not a phrase bandied around on the reg. But after seeing these images the thought of our cold-blooded friends kicking around in the waters has just sent a shiver down my spine. Someone pass the cocoa. Because that’s exactly what’s happened to alligators in North Carolina where temperatures have dropped below freezing this week. On Monday (January 28), Motherboard reports, at least 18 American alligators at the Shallotte River Swamp Park in Ocean Isle Beach entered a dormant state called ‘brumation’, a ‘semi-shutdown’ mode that allows them to slow their metabolism and go without food. Makes you kind of jealous. Similar to hibernation, which generally refers to mammals, brumation can last for four to five months. The reptiles have been known to surface to keep their nostrils above water so they can breathe. The same phenomenon occurred last year at the Swamp Park. Park general manager George Howard gave an insight to Mother Nature Network. It was incredible really because it’s southeastern North Carolina. It’s certainly not a typical place where we get ice like that. But it certainly did this year. It didn’t take but a couple of seconds to realize what it is that they were doing. It’s a survival mechanism that they do in the event they need to breathe. They stick their noses up out of the water and if it freezes, it will freeze around their snout and still allow them to breathe. 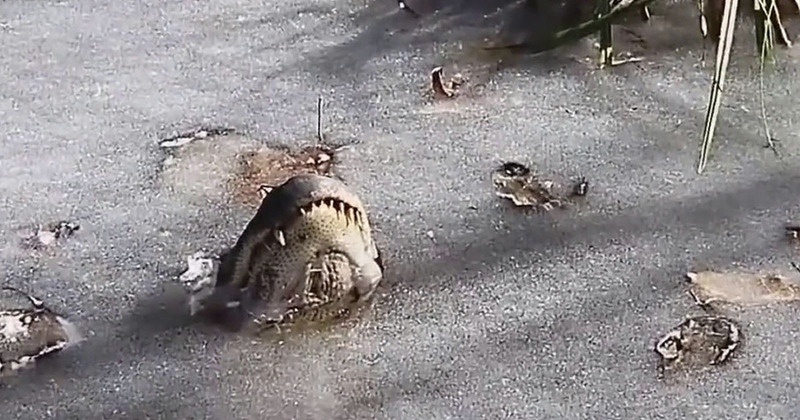 Just in case seeing alligators frozen under water doesn’t give you a chill down the spine – and you must be some kind of sociopath if it doesn’t – spare a thought for folk in Chicago, Illinois. It’s so cold up there spaghetti is freezing upon impact with the air. Nope. Let’s just have summer already.